The fire which badly damaged the vacant Wheatsheaf pub on Wednesday (4 July) night has been confirmed as arson by Sussex Police. 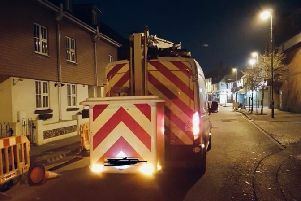 A police spokesman said officers attended the scene in Richmond Road, Worthing, at about 9.30pm following a report of a fire from West Sussex Fire and Rescue. The spokesman said officers are now investigating the incident. On Thursday a spokseman for the fire service said four fire engines arrived, accompanied by the Command Support Unit, to find the first floor of the building ‘well alight’. Police have asked for anyone who has any information to report it online or call 101, quoting serial 1574 of 04/07. Worthing Borough Council’s planning committee rejected the scheme on grounds which included overdevelopment, the harmful impact it would have on a conservation area and the lack of outdoor space and privacy for residents. Read more on the refusal of the flats plans.